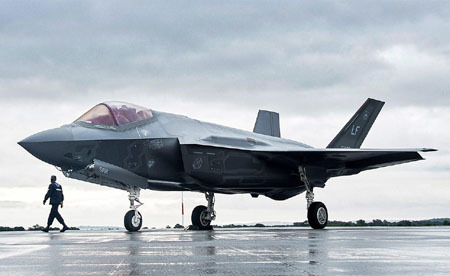 The United States on April 1 said it has stopped the delivery of F-35 fighter jet parts to Turkey following the Turkish government’s decision to purchase the Russian S-400 surface-to-air missile system. The U.S. said it was immediately halting the delivery of F-35 parts and manuals as the first step toward ending the actual aircraft sale, The Associated Press reported. The U.S. had initially agreed to deliver two F-35s to Turkey in June. The U.S. had agreed to sell 100 of the fifth-generation F-35 fighters to Turkey, initially planning to deliver two aircraft to Ankara in June. The U.S. move comes just days after Turkey’s Foreign Ministry said the Erdogan regime was committed to a deal to buy the Russian system and was discussing delivery dates. The U.S. has for months warned the government of Turkish President Recep Tayyip Erdogan that buying the Russian S-400 system would jeopardize its planned purchase of the advanced fighter aircraft. Gen. Curtis Scaparrotti, the top NATO general, told Congress last month that his best military advice would be that the U.S. not work with an ally that is acquiring Russian systems that can threaten one of the American military’s most advanced capabilities. Officials have also expressed concerns that Turkey’s acquisition of both U.S. and Russian systems could give Moscow access to sophisticated American technology and allow it to find ways to counter the F-35, the AP report said. The Pentagon has begun taking necessary steps to find other sources of supply for the Turkish-produced parts of the F-35, the State Department said. Turkey is one of eight national partners that help build the F-35, producing parts of the fuselage and cockpit. The United States offered to sell Turkey Patriot missiles instead, but Erdogan favors the Russian missiles, “which are cheaper and come with a co-production agreement that would help Turkey expand its defense manufacturing base,” McIntyre noted. Turkey has already bought two F-35As, which are at Luke Air Force Base in Arizona, where Turkish pilots are being trained to fly them. But the planes will remain in the United States unless Turkey cancels the S-400 deal, the Pentagon said. Among those ministers is Turkey’s Mevlut Cavusoglu, who just last week insisted that the agreement to buy the S-400 was “a done deal,” after he met with Russian foreign minister Sergey Lavrov.